"Han Trainer Pro doesn't record my data. The learning profile gets lost." Please note that all solutions suggested here are at your own risk. Your learning profile is supposed to be recorded every time you hit the "Save" button and it is supposed to be loadaed every time you login with the same user name. Due to security restrictions in Adobe Flash (that's the technology Han Trainer Pro is based on), the learning profile cannot be stored as a normal file on MAC and Linux systems (no problems on Windows though). Instead, it is stored as a so-called "Shared Object" (or "Flash Cookie") which is very similar to a browser cookie (a file that stores bits of information) . More and more browsers and privacy protection add-ons delete Cookies and "Flash Cookies" in an effort to prevent websites and flash programs from remembering the user's actions. In some cases, remembering such actions can compromise the user's privacy. In our case however, remembering the user's actions (i.e. which words the user has already learned) is a useful feature . On Windows, where you can download a setup.exe file, this problem does not occur. Solution 1: Try changing your browser's privacy settings. 3.) Make sure "keep until: " is set to "they are no longer valid"
1.) 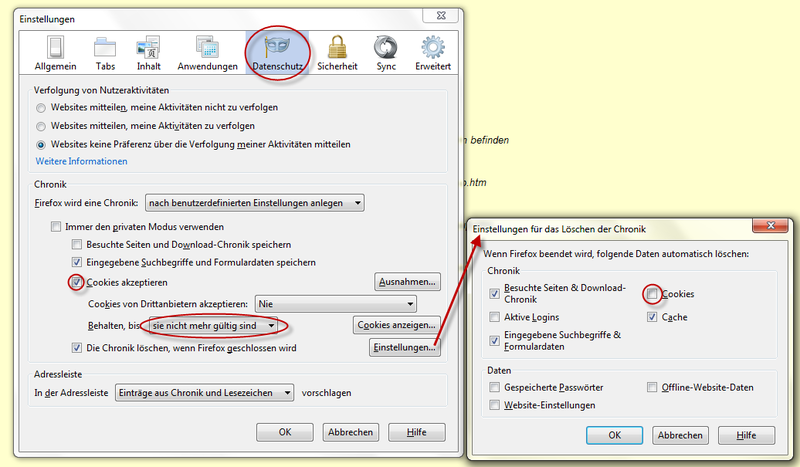 go to Internet Options > "Data protection" tab. 2.) 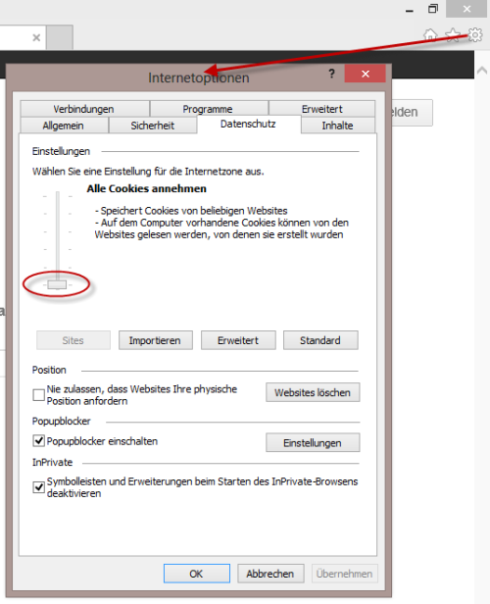 Move slider all the way down to "accept all cookies"
Solution 2: Copy Han Trainer related Cookie files to a secure location before performing a (general) cookie deletion. Solution 3: Exempt Han Trainer related Cookie files from cookie deletion.